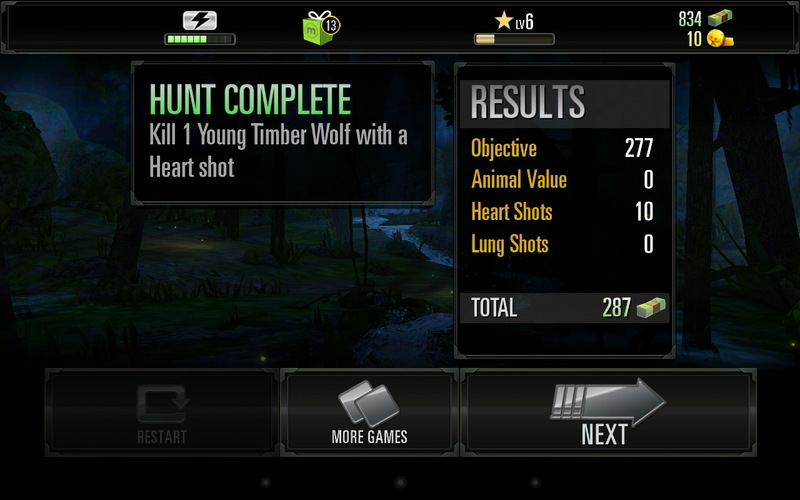 I have never hunted in my life, unless you consider fishing to be part of the whole hunting genre… Rumor has it, I cried when Bambi’s mother died, I cried when they shot Old Yeller, and I thought Dances With Wolves was yet another way for Hollywood to stab me in the heart when Kevin Costner’s wolf died. And even though I enjoy fishing, I fretted for days trying to figure out the quickest and most humane way to kill a trout once I made the transition from sport to take-home fishing. Yea, I live in Portland. So what. 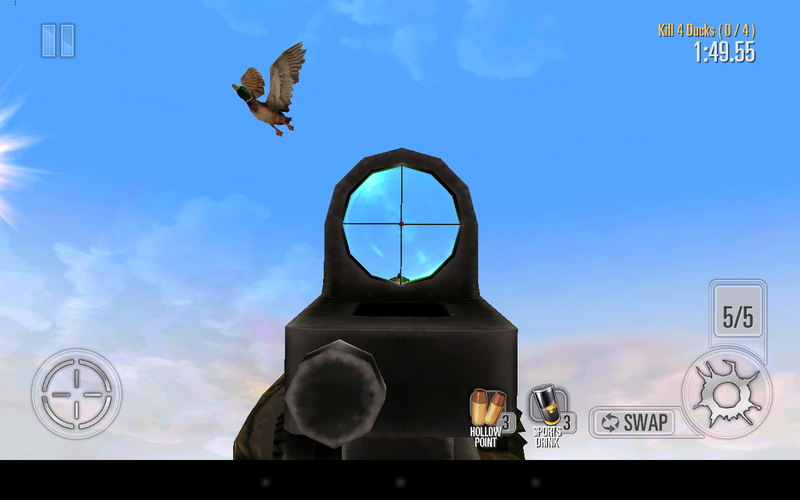 I decided to review Deer Hunter 2014 for two reasons: a) I always see drunk jocks playing Buck Hunter at my local bars on Saturdays (the one with the actual plastic shotguns) and, b) I’ve been into testing my boundaries lately. 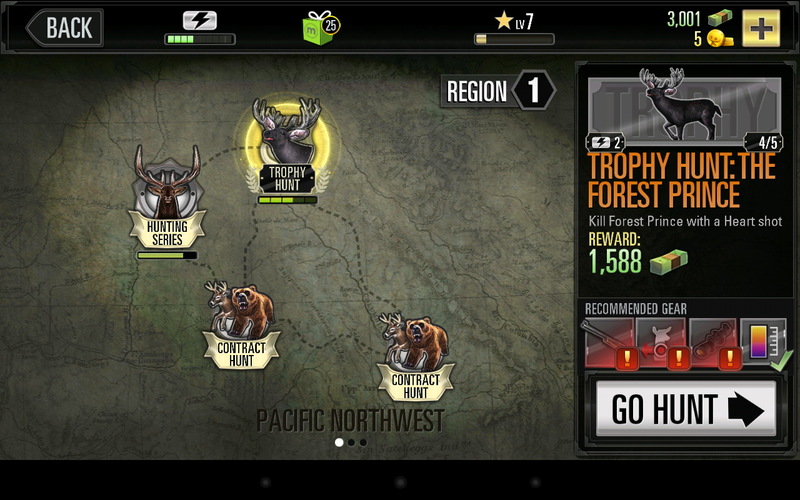 After downloading, installing, and playing Deer Hunter a good way into the first campaign – the Pacific Northwest (fitting) – I’m happy to say that my inner-hippy isn’t screaming and clawing its way out of my mortal coil. You begin Deer Hunter 2014 with a basic rifle and tickets to the standard Hunting, Trophy, and Contract Hunt game modes. The Hunting campaign takes you through various challenges, aiming for specific organs under a strict timer-clock. Initially, you’ll just kill a couple goats however best you can manage; a bullet through the noggin’, one through the lungs, or maybe a combo of generic body shots. 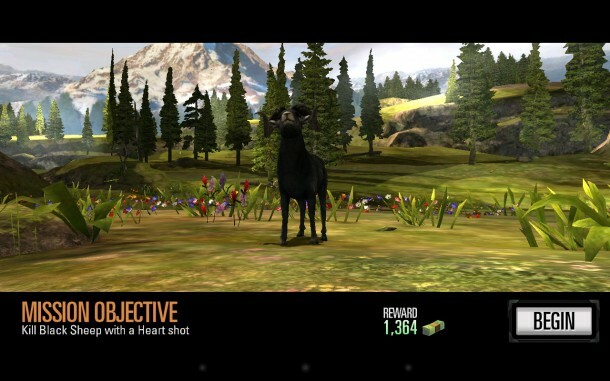 Once you take home a few heads, it’s game on for Deer Hunter. 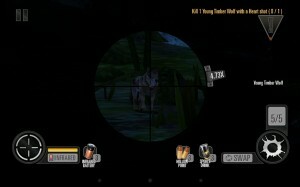 Your hunts are either in broad daylight or under the cover of moonlight, and a stray shot will send your prey scattering. While the arcade games make readjusting your sights somewhat easy with a physical plastic gun, there is no such luxury in Deer Hunter. You need to get it right the first time, or you’re assed-out. 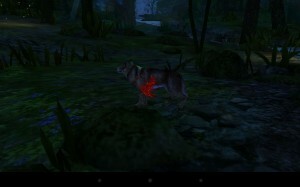 Missions quickly begin requiring you target specific organs – heart, lungs – in order to take down your prey. Hearts, obviously, are pretty damned small and hard to target if an animal is walking around. 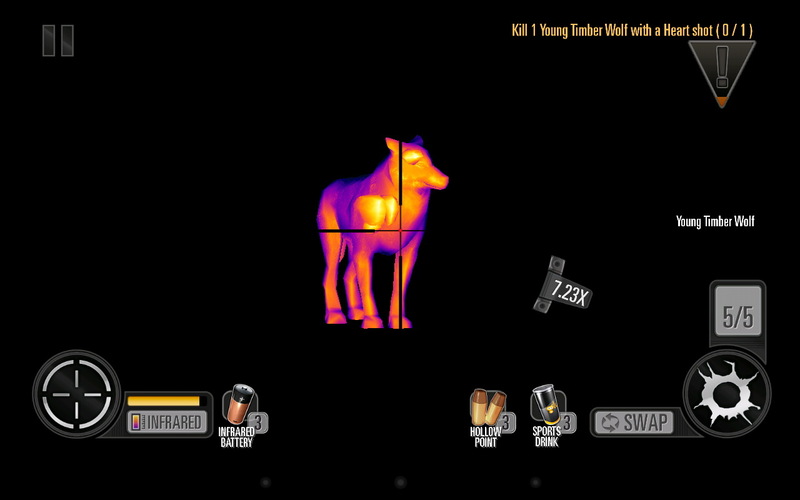 Lucky for you, your rifle sports an infrared scope. 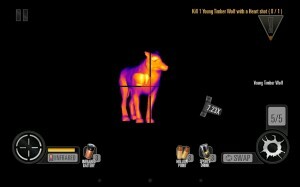 Toggling the infrared will net you a few seconds of thermal-cam hunting, but this option is battery powered and limited in duration. 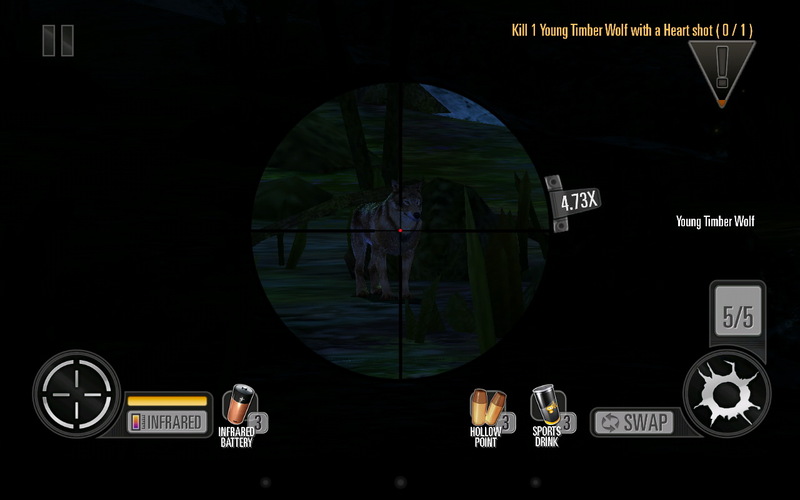 Let’s say the mission has you killing two wolves with heart shots… Within a minute or so, you’ll need to target, zoom (with the scope), flip on the infrared mode, and take a shot. Times two. 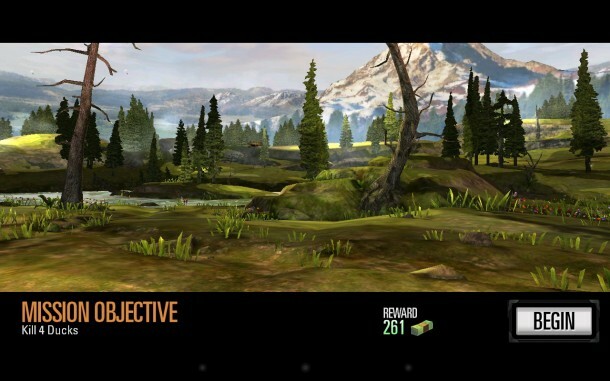 Deer Hunter’s difficulty ramps up fairly quickly. In addition to the number of animals and the specificity of organs, missions begin suggesting (and requiring) certain stats from your weapons. 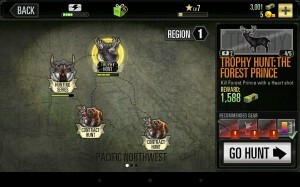 As you complete the various missions, story and trophy, you’ll collect cash. 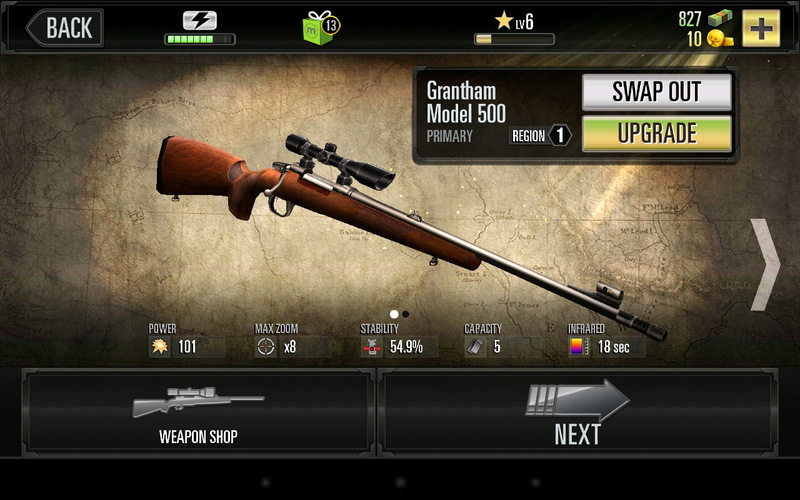 You can spend your hard earned cash on weapon upgrades (stock, barrel, scope, ammo, etc.) as well as entirely new weapons. 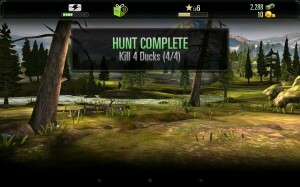 Deer Hunter features four gun types – pistol, shotgun, rifle, and automatic rifle – so you’ll never get bored decimating the local deer population. Glu Mobile starts making things tricky quite quickly though with the usual mobile game trappings, in the form of energy and imports. You can get away with playing a few missions gratis, but your energy meter steadily depletes. Obviously, you can purchase more energy by giving Glu Mobile some real-world money. Energy aside, once you get to the upper-tier weapon upgrades you’ll start to import your parts. What does this mean? You get to wait 5min of real-world time before your upgrade becomes active. 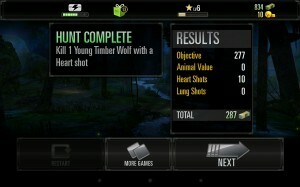 And yes, you can spend Glu Coins to speed the process. Typical mobile trappings. 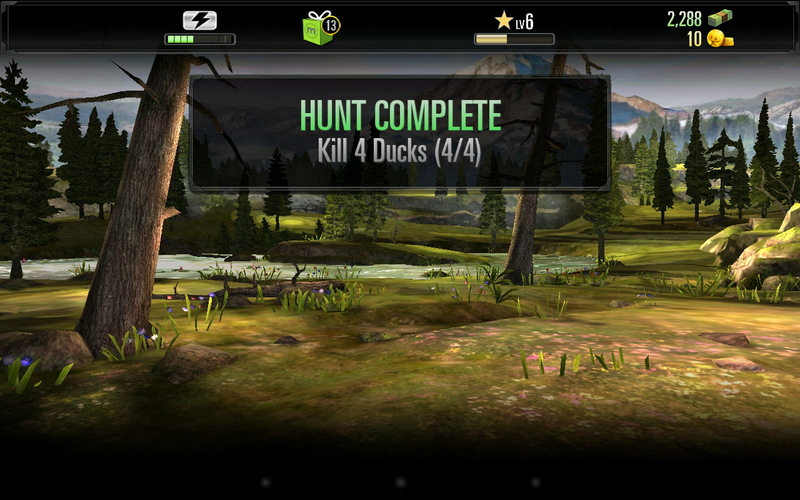 If you find that the main hunting mission requires higher specs in terms of damage or sight or clip, you can always switch to the side-campaigns and do some trophy hunting. Take your shotgun and blast some ducks from the sky or go after Old One-Eye with your trusty rifle. All of the trophy missions net you money, even if you fail, so you’ll be constantly upgrading and buying new guns. Why isn’t this game sponsored by the NRA? Over all, the graphics are dialed-in and glitch free. Nighttime hunts are especially pretty, featuring fireflies floating about on the screen. I thought it was a tad on the easy side, to be honest. Anyone with a decent finger could pick off two goats in a heartbeat, so running out of energy happens frequently and easily. I’m sure this was the plan. The only gripe I had in playing Deer Hunter 2014 was that you pretty much have to kill your targets flawlessly, on the first shot. 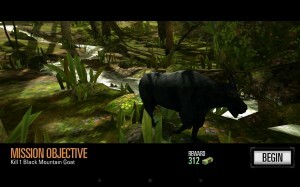 If you miss or get a body shot, the animals scatter and eventually run off screen. Due to the awkward tablet interface and having to swipe to catch up with the fleeing prey, you have no chance in hell to get in a make-up shot. There’s simply no comparison to having that plastic shotgun at the ready. 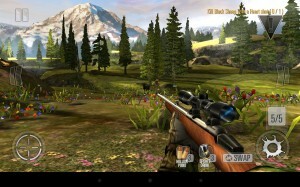 Deer Hunter 2014 is an attractive diversion for those of you who are stuck inside for the winter, dreaming about next spring’s hunt. Free isn’t a bad price to pay, but you’ll quickly run up against the game’s energy and import limitations. However, I’ve found that all you need is to have a few of these energy based games running simultaneously to make it worth your while. 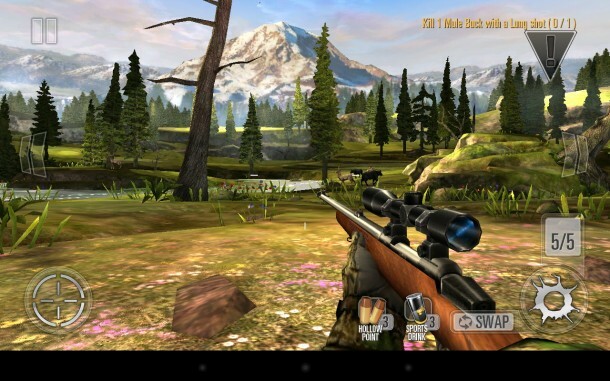 Deer Hunter 2014 is a solid title in the hunting genre, if not a tad bit simplistic.